Three species from three genera of the phacopids have been assigned diagnoses and names. One other remains assigned to a genus without a specific name. However, a number of different forms have surfaced since the earlier investigations, including diminutive varieties, that may represent different species. 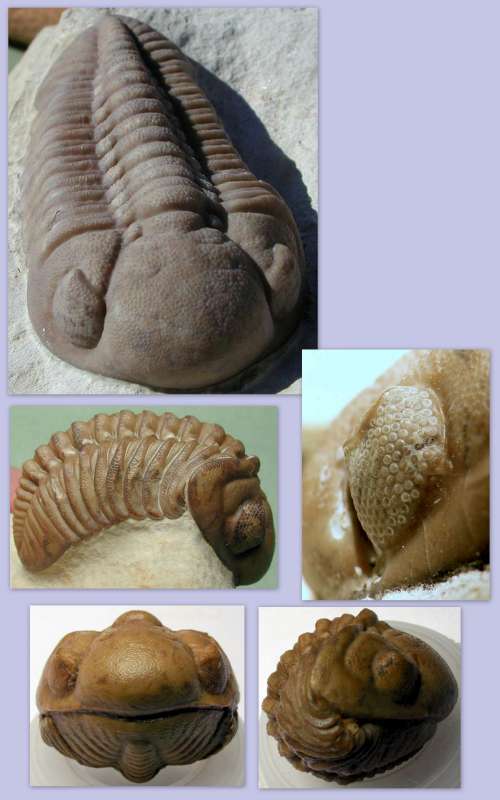 These particular trilobites may make great contributions to our understanding of phacopid lineages and their investigation should be taken up by a serious student of trilobites. Paciphacops campbelli occurs in Haragan and Bois d'Arc strata, but only in the latter are the tiny specimens shown in the first photograph below consistently found. Large specimen sizes in the Haragan average about 2 cm in length. The species is distinguished by the structure of its eyes, which have fewer lenses on the visual surface than related phacopids. This can be seen in the second photograph below. Both of these photographs were taken by me over the year end holidays of 2010 at Bob Carroll's shop as he was working on these and other specimens for the 2011 Tucson show. Notice in the image of a Bois d'Arc Paciphacops species below how large the fingerprints are to the left. 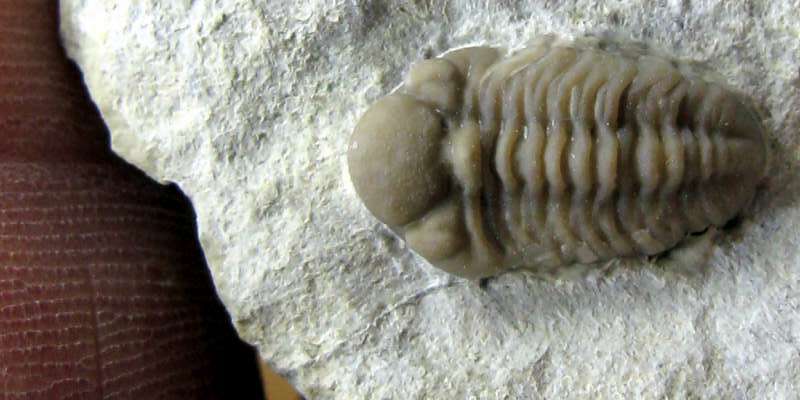 Kainops raymondi is the most common trilobite found at Black Cat Mountain. Once raymondi was thought to be in the genus Paciphacops, but was later removed to Kainops for a number of reasons. Though it tends to be slightly larger in size, the easiest way to distinguish raymondi from Paciphacops campbelli is to compare the lens density of the eyes. Kainops raymondi has a greater number of lenses in each eye as the viewer will confirm by comparing the image directly above with some of the antero-lateral images below. Below is an interesting double specimen from the Bois d'Arc formation, found in the area but not specifically at Black Cat Mountain, nor excavated and prepared by Bob Carroll. 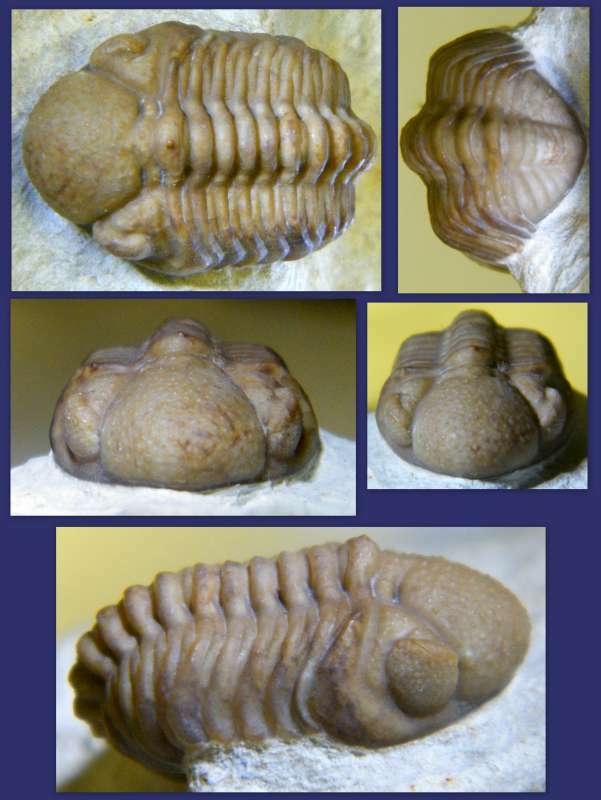 It was posted as Kainops invius on Wikimedia Commons, courtesy of Moussa Direct Ltd The lower trilobite is inverted, showing the ventral surface of the trilobite and giving a rare, nearly complete view of the internal structure of this cuticle. 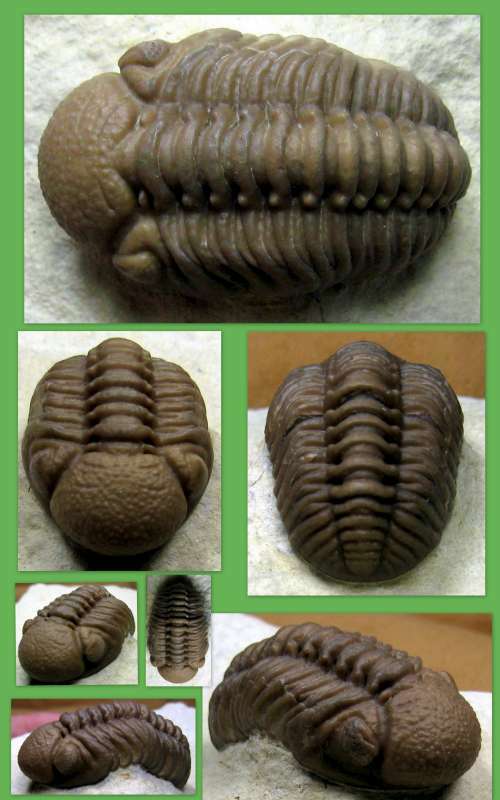 Below is a collage of images of a diminutive Kainops specimen, which is 10.5 mm wide across the base of its cephalon. Given the small size of this specimen, I was attempting to obtain photographs having good contrast and magnification across the entire image, resolving in particular the individual lenses of the eyes and the pattern of glabellar tubercles. For this work I used my Fujifilm Finepix S2000HD camera. 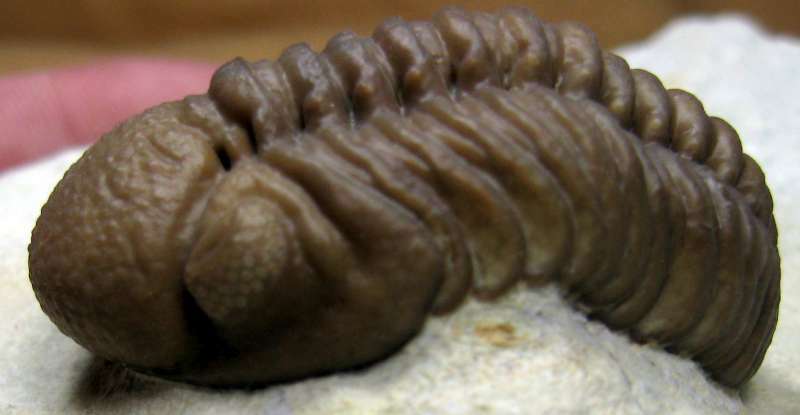 Viaphacops species is a rare trilobite at Black Cat Mountain. It is larger in size than Kainops, and generally similar in appearance to Paciphacops. However, the later posterior corner of the cephalon is more sharply turned. The more subtle distinguishing features of Paciphacops, Kainops and Viaphacops are described in detail in my book Trilobites of Black Cat Mountain. The photograph below was provided by Steve Marley. Below is a collage showing various aspects of a Viaphacops species. Photographs by G.P. Hansen. Lochkovella deckeri was once placed in the genus Reedops, but recent revision by Sandford has this species reassigned to Lochkovella. Lochkovella deckeri is noticeably larger in overall size than Viaphacops and Kainops, both in overall length (3-5 cm) and in its width and height profile. It is about as rare as Viaphacops. The upper photograph was taken by G.P. Hansen; the eye enlargement was provided by Keith Minor; and the remaining images in this collage were provided by John Moffitt and Neal Immega.